Annlee Decker created this short film for her father. Enjoy. All shots taken on location in BlueDark Outfitters Hunting lands in North Hampton, Bertie, and Hertford County in North Carolina. Music featured in this short film is: "And Am I Born to Die?" BlueDark Outfitters is a family affair. My name is Charles Decker. My wife of twenty-five years, Christiana, was raised in Northampton County. It is her family’s farm that I have hunted for over two decades and have the pleasure of sharing with my hunting clientele. I fell in love with northeastern North Carolina and quickly learned to appreciate the laid back pace and atmosphere. We have two sons and a daughter who have been my hunting companions for many years. My oldest son is responsible for our name. He still describes his hunting mornings as black dark, grey dark, and finally BlueDark. You will find his favorite hunting story on the website. I am in my fifties, originally born and raised in the Charlotte area of the state in Belmont, NC. I have hunted all my life. My first hunting trip was with my father and brother. I will never forget it. I was a cold, wet, seven-year-old boy, wading through a flooded rice field in the dark, and loving every moment. We shot a few ducks and tried our hands at deer hunting, but what I remember the most was the hot sausages, the campfire, and the thrill of the experience. I have been passionate about hunting and the outdoors from that first moment. Ever since, I have looked for every opportunity to be outside. 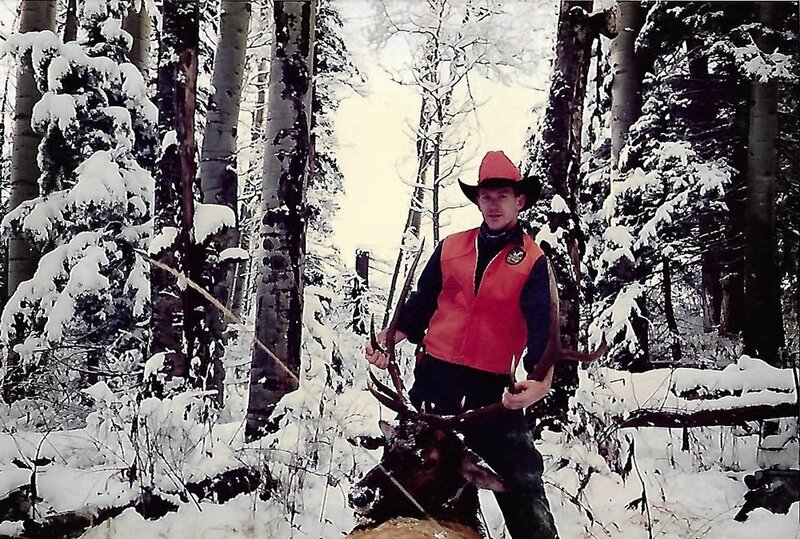 My two favorite experiences as a young man are an elk-hunting trip in Colorado and a trip to British Colombia, Canada. I am a tile and stone contractor in the off-seasons, which allows me to be both inside and out. I was a scoutmaster for my sons and their peers for ten years, during which time we camped somewhere in the Appalachians once a month. My wife says that totaled up, I have spent years sleeping in the woods. My involvement in scouting helped guide us on our path to begin our outfitting business. I had taken numerous friends and family members on hunting trips and enjoyed the fellowship and especially the excitement of the children. It was like having my seven-year-old rice paddy experience all over again each time. At first, I was very hesitant to turn hunting into part of my livelihood because I was concerned that doing so would make hunting feel like work. I could not have been more wrong. I have found that helping others achieve their goals is incredibly fulfilling. By choosing BlueDark, I know that you will have a safe, exciting adventure that will make you thirst for more. Our goal is to create an environment where our hunters and guests feel welcome and comfortable to come relax and enjoy the outdoors. We will do everything possible to provide you with a rewarding hunt and an experience you will value for a lifetime. Bring your friends and family with you to experience the hospitality and hunting environment you can find only in northeastern North Carolina.